If there's one trend that seems to be sweeping the wedding nation, it's definitely the bridal braid. From loose romantic braids to tightly-wound fishtails, the braid is making a big statement on the heads of many of today's brides. In this series, you'll find some of the most gorgeous bridal hairstyles featuring braids to inspire your wedding day look! Whether your style is classic and sophisticated or laid-back and boho, there's a wide variety of braid techniques to pull your whole look together. Fishtail braids are making a splash in the wedding world, and it's easy to see why. These dreamy, mermaid-like braids can be easily dressed up or down, depending on the theme of your day. 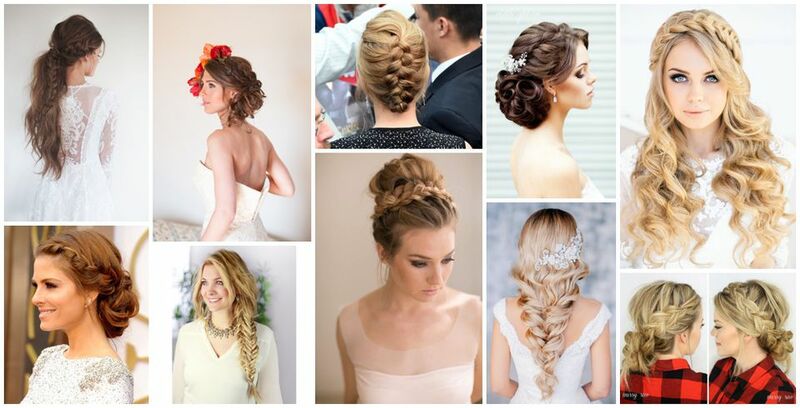 The braided crown look is hot for weddings, and there are numerous ways to wear it. This version includes a braid wrapped around the head like a crown, with the majority of the length of the hair left down in curly waves. Worn with or without a veil, this hairstyle is a stunner for your big day. If you're looking for something soft and romantic, this loose flowing braid style may be up your alley. This style evokes a chic mermaid and would be lovely for a wedding day. This large braided style makes quite a statement, so covering it up with a veil would seem silly! A simple and classic French braid is always a lovely option to consider. This style works great for every member of the bridal party from the flower girl and bridesmaids, to the bride herself! You can dress up this simple look by adding sprigs of baby's breath to the braid. This bridal hairstyle as seen on Style Me Pretty is a gorgeous look, accessorized with fresh flowers for a bold pop of color. The soft braids worn as headbands, paired with the pinned up curls make for an elegant and glamorous look, made more modern by the floral hair accessory. Maria Menounos' braided updo from the 2014 Oscars Red Carpet is perfectly chic and sophisticated for a wedding. This style is chic while not being too formal, and would work just as well for the bride or the bridesmaids. If you lean more toward the bohemian side with your style, you may want to opt for this messy Boho braided look. This style is much ​looser and less refined, for an ethereal and casual-chic vibe. This loosely braided updo from blogger Missy Sue would be perfect for the bride, bridesmaids, or a stylish guest. Since this style is loose and non-fussy, it'd be perfect for everyday wear as well. This elegant braided updo is the perfect style for a classic and timeless wedding day. The look exudes romantic elegance and would pair well with any style of dress. Adding a fabulous accessory to the look such as the brooch hairpin really elevates the glamorous look as well. This chic braided style can easily be dressed up or down, depending on your wedding theme. Paired with a veil or worn on its own, this braided bun is a wonderful choice for a wedding day but is also casual enough for everyday wear.